Here’s a quick list of some basic essentials in the kitchen. 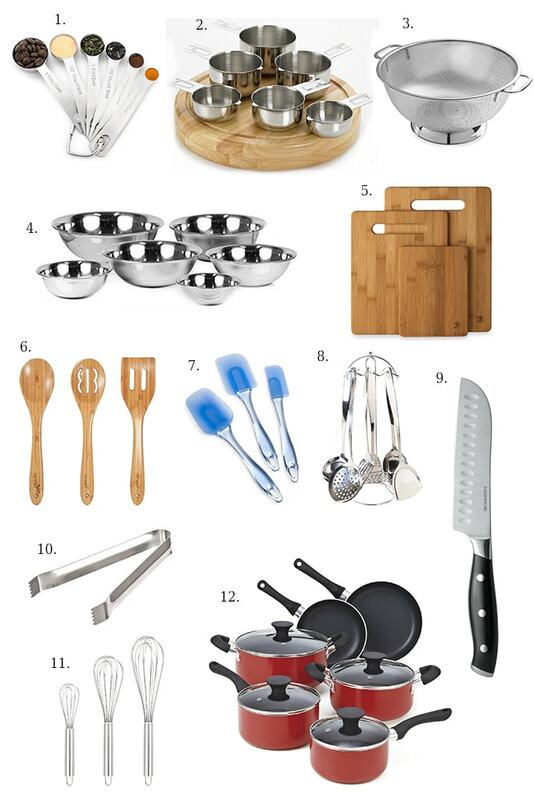 From cooking utensils, to pots and pans, to prep stuff and measuring tools, these staples will be used in every day cooking. A must in the kitchen to get exact measurements of seasonings and herbs. Your set should have 1 tablespoon, 1/2 tablespoon, 1 teaspoon, 1/2 teaspoon, 1/4 teaspoon and 1/8 teaspoon. While measurements in cooking are a little forgiving, it’s always good practice to follow the original recipe’s measurements exactly and season it to taste from there. Another essential for dry stuff like flour, sugar, cheeses, bread crumbs and liquids like milk, heavy cream, water, broth and stock. Your set should have 1 cup, 1/2 cup, 3/4 cup and 1/4 cup. This is handy for draining cooked pasta. A 5-quart colander can hold up to 1 pound of cooked pasta for those big meals. Used for just about everything in prepping meals. Use the large ones for making meatballs, the medium ones for prepping chopped vegetables like potatoes, celery and carrots or mixing batters and the small one for whisking eggs and sauces. It’s always good practice to separate your raw foods. Use the big one for meats and the medium and small one for vegetables and herbs to reduce the risk of food contamination. These spoons are great for stirring sauces, sauteeing and general cooking purposes. Use them on your non-stick cookware so you don’t damage the finish. These are great for cooking with too, especially for getting every morsel of food from your mixing bowls or pots and pans. They bend in such a way that they can scrape off every little thing from every little corner. Waste not! A nice basic set for ladling soups, mashing potatoes, frying food and cooking. The metal turners are particularly handy for sliding neatly under meats and seafood to turn them over with minimum fuss and splatter and they’re also great for stir-fries. This is the king of knives. It’s great for almost everything: slicing, dicing, cutting, chopping and can be used about 99% of the time a knife is called for. Use these simple tongs for flipping stuff over in the pan and general cooking. It’s a tool that’s often overlooked but comes in real handy. I feel the smaller size makes it less awkward for daily use than the standard bigger ones. Use them for whisking eggs, sauces, gravies, batters. It’s always handy to have multiple sizes. The small one for eggs, medium sized for sauces and gravies and big ones for batters. A great basic set. The skillets can be used for sauteing meats and veggies, pan-frying meats and seafood and cooking eggs. You’ll end up using these a lot. The pots are good for making sauces and gravies and the 5 quart is wonderful for cooking pastas, soups and making pasta sauce. That’s it for the basics of what I think every basic kitchen should have. To summarize, here’s a quick list of everything you’ll need. Disclaimer: This post contains affiliate links from Amazon which helps keep the rest of my content free. Thanks for your support!